Oxwich Nature Reserve at Oxwich Nature Reserve (NRW)0300 065 3000work Nature ReserveOxwich supports a huge variety of wildlife and is protected as the Oxwich Bay SSSI and the Gower Ash Woodlands SAC.It has a mosaic of different habitats including dune slacks and limestone cliffs. The relatively small area of the reserve encompasses a variety of different habitats which include a calcium-rich dune system with dune slacks and saltmarsh, freshwater lakes and marshes and adjacent wooded areas on limestone slopes. This variety supports a remarkable range of plants and animals. The dune slacks, for example, support large numbers of orchids in spring and early summer. The wooded cliffs are composed mainly of oak and ash, but also include wild service and wych elm. Six hundred species of plant have been recorded here, including stinking helleborine, dune gentian, round-leaved wintergreen and rock whitebeam. The reserve’s bird life is also impressive. You may be able to spot a Cetti’s warbler, reed warbler, sedge warbler or even the rare bittern which, after years of absence, recently returned to Oxwich. And small numbers of wildfowl like teal and gadwall overwinter here. Invertebrate life is also flourishing, and includes rare species such as the Cepero’s ground hopper, hairy dragonfly and the strandline beetle Nebria complanata. There is a public footpath through the part of the reserve that lies to the south of the village. Another footpath runs along the edge of the marsh. There is a car park with toilets and refreshments are also available. In Oxwich village there are numerous campsites and a hotel with a restaurant. The car park and toilets are owned by the Penrice Estate and are open seasonally between April and October. There is a charge for parking which varies during the season. 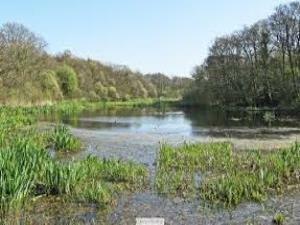 Oxwich National Nature Reserve is 20 kilometres west of Swansea, just outside the village of Oxwich on the Gower. It is situated on a minor road off the A4118. From the Penrice direction, turn left at the village crossroads opposite Woodside Cottage apartments. The nearest train station is in Gowerton. The OS grid ref is SS 501 865. Parts of the reserve are open access, while other areas are open to groups by arrangement only. Oxwich village can be reached by the minor road off the A4118 west from Swansea. There is a public footpath through the part of the reserve to the south of the village. Another footpath runs along the edge of the marsh.